I am going through a phase at the moment of having Ryvita and ricotta for breakfast. With a piece of fruit afterwards I think this is a pretty good breakfast. This started with me having ryvita and cottage cheese which then evolved into Ryvita and ricotta because ricotta is easy to make and cottage cheese is more difficult. I then moved on to wanting to make the Ryvita. I figured that it is just a type of bread and therefore I could make it. This morning I did just that. I had to improvise a bit due to lack of ingredients and because I wanted the Multi-Grain type rather than Original. I found several recipes but none that seemed exactly what I wanted, nor had the ingredients to make. All required rye flour but I only had rye flakes that I use for making bircher. But isn't flour ground up flakes, in a round about sort of way? The flakes went in the food processor. I wanted to have some grains included so I soaked some purple wheat grains in boiling water then added them to the rye flakes food processor to break them up a bit. Fennel seeds, I didn't have any . . . but the flavour of anise is a bit like fennel and Pernod is flavoured with anise so why not add a slug of Pernod to the dough. I thought that was a great idea. Luckily yeast is one of the few things that can survive in alcohol. Soak the grains in the boiling water for as long as you like. Overnight would result in a softer result. I only gave it about 30 minutes because I was impatient. Put the soaked grains and their liquid in a food processor with the rye flakes and process to a dough like mass. 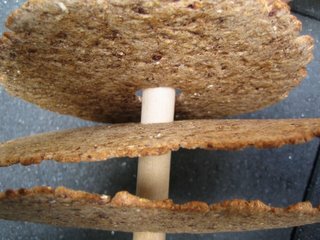 The flakes and grains should be well broken, a few grains will be visible. Mix to a dough with the flour, yeast, salt and Pernod. Add more water as required. The dough will be stiff. Break the dough into four pieces and form into balls. Leave to rise for 40 minutes. Preheat the oven to its highest temperature - my oven reaches 250°c. Shape the dough by rolling out as thinly as you can without it breaking. You can make traditional rounds with holes in the middle or rectangles or indeed, any other shape you like. I made half the dough into the rounds you see below, and half into the rectangles, aka Ryvita, you see above. If you make rounds cut a hole in the middle large enough to fit over the handle of a wooden spoon for cooling once they are cooked. Prick the dough all over with a fork to prevent it rising and cook for four minutes or until they look cooked and slightly golden. Leave to cool - in the case of the rounds on the handle or a wooden spoon or just on a wire rack. Turn the oven down to 180°c and put the whole lot back in for 5 minutes or until they are dry and hard. The Pernod was a fantastic addition, it worked really well. The anise flavour was definitely there but not overpoweringly so. These are really good crispbread, I am very pleased, it was a good experiment! I am going to buy some rye flour and try a plain version. Breakfast is sorted for a while yet - I see a world of crispbread opening up before me. I cannot believe you tried to make ryvita! cool! An Israeli friend introduced me to ricotta and honey with a sprinkling of cinnamon. Totally divine! Should be a perfect topping! 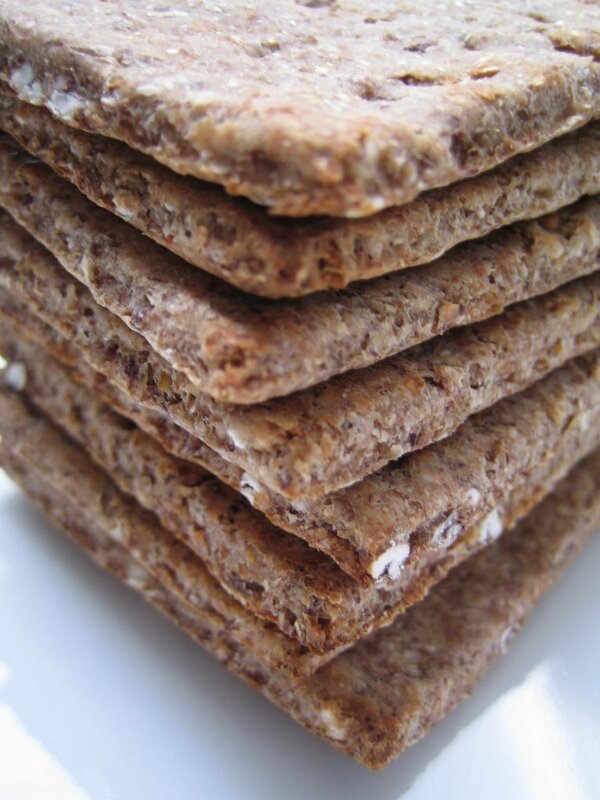 I am teaching a class about Australia and would like to make Ryvita for my students. Would you mind posting the recipe minus the alcohol please? They are a little too young for Pernod.